Many manufactures use this type of label on their upholstered products to keep them from being liable for problems that may occur during the cleaning process. Professional cleaners know that with knowledge, experience, proper cleaning agents, and advanced equipment they can clean the majority of fabrics that are labeled “dry clean only”. 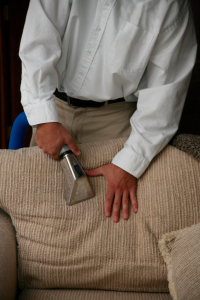 Your Mighty Clean Carpet Care technicians will evaluate your upholstery and notify you if your furnishings should be dry-cleaned only. Carpet Cleaning for Appearance and a Healthy Home! Located in Northern VA, Mighty Clean specializes in Carpet Cleaning, Upholstery Cleaning, Tile and Grout Cleaning, Rug Cleaning, Pet Stain and Odor Removal, and Commercial Carpet Cleaning. Our service area includes Fairfax VA, Centreville Virginia, Ashburn, Gainesville, Bristow, Haymarket Alexandria, Arlington, Reston, Clifton, Chantilly, Herndon, South Riding, Springfield, and all surrounding areas.